I have been very excited to tell this story and so pleased I've reached the point chronologically with my blog entries that I can. Its a bit of a long one but I hope you enjoy it, its very special to us. The Henry Jones had an inner atrium which would have been the production floor for the jam making factory years ago. It was flanked by little boutique shops, a deli cafe and two art galleries. 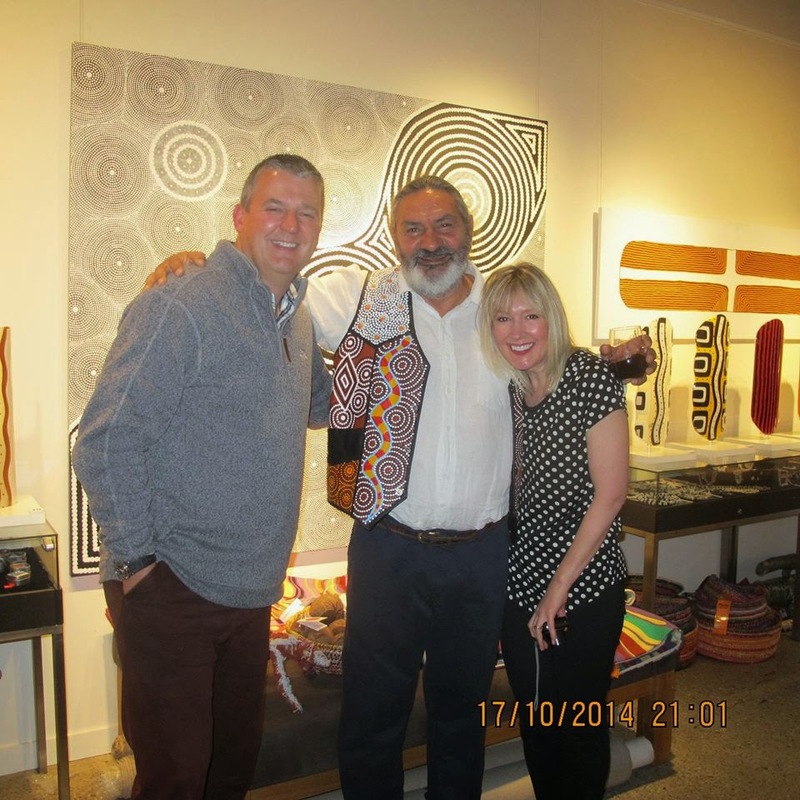 Whilst I had a potter around the "girlie" accessories on display, Hubster went into an art shop championing aboriginal works of art, Art Mob it was called. Quite out of character, he came to find me. "Hey come and take a look at this?" I was a little puzzled as Hubster is not an art gallery kind of guy but clearly something had caught his eye. He waved me over to a very large piece on display and I stood in front of it, quite mesmerised. It was really striking with a bold black and white colour-way and the beautiful dot-work was the best I'd ever seen. 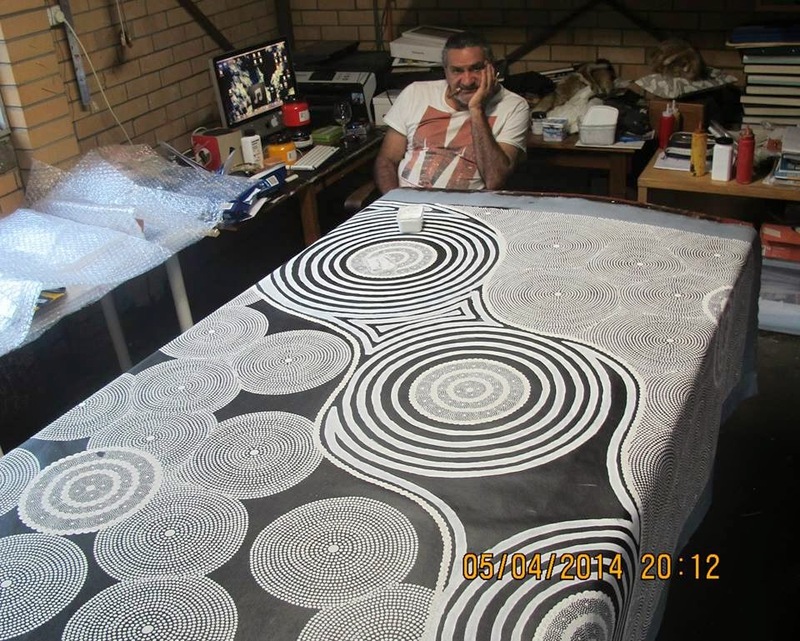 Dot painting is a very specific characteristic of and method used in indigenous art. It is also extremely difficult to do and such a fine example, on such a large scale was really quite a sight to behold. Euan the Art Director and owner of the gallery sauntered over to us. The three of us just gazed at it for a while, slowly nodding in agreement. "I am so delighted to have this exhibition here" he continued "the official launch is at 6pm tonight and the artist Sam Juparulla Wickman will be with us, this is his signature piece, why don't you come along? Each painting has a story to tell and Sam is the man to tell it!" he said. I copped a look at the price tag and even though it was pretty hefty, we both agreed it warranted it, given the months and months of work involved. It was called Little Sandy Creek or Nunungoodu (given its indigenous name). We went back to our room and had a good chat. I couldn't believe how attached we both felt to this piece of art and that we were seriously considering buying it, this was completely left field for us. We had never done anything like this in our lives and yet it seemed to have gripped us both in equal measure, it just felt right. Hubster got on the computer and shifted some funds around. Just in case. We pitched up at 6pm and with a nice glass of Tassie red in hand, planted ourselves in front of "our" painting. We already felt it belonged to us. Euan introduced us to Sam. We warmed to him immediately, he exuded kindness, fun, passion for his work and pride for his heritage. He was was very humble with soulful eyes that also bore a definite twinkle of mischief in them too! He spoke about Little Sandy Creek with the same affection that you would have for an old friend and that's exactly what this labour of love will always be to Sam. What a character Sam is. He is 62 years old and up until 11 years ago had never even picked up a paint brush. He is an archaeologist by profession and and a renowned and a highly sought after one too. 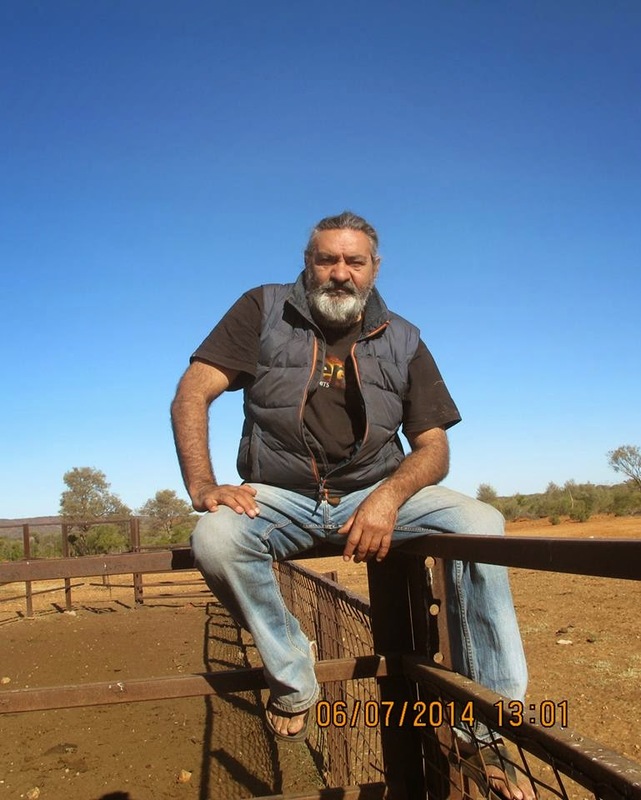 At the age of 9 he was drummed out of Alice Springs and away from his aboriginal heartland for being a bit of a delinquent. 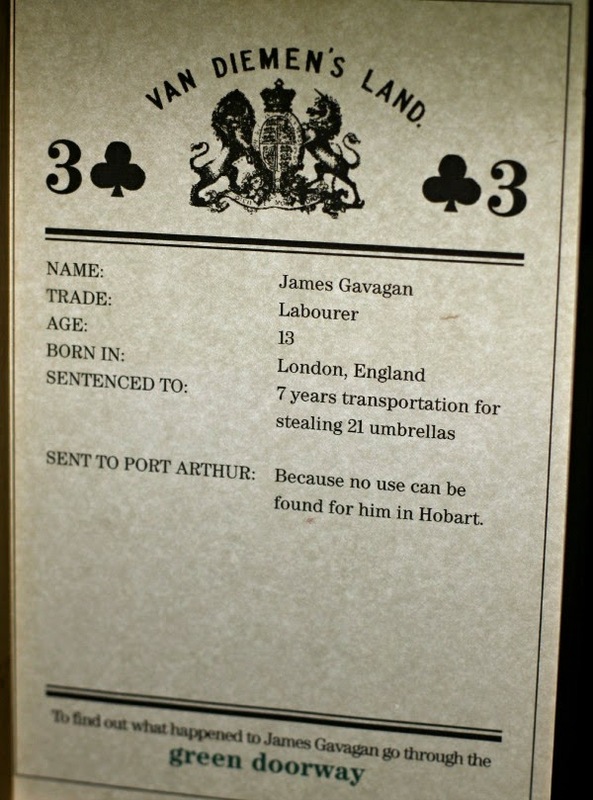 It would seem Sam was too much for his people to handle and he was sent to a boarding school in Sydney. Even today, Sam doesn't strike you as a conformist. Sam is Sam. Here Sam was projected into a world so far removed from anything he had ever known and entrenched in this predominantly white, colonial life, with its alien culture and customs, it seemed over time that his own roots had became diluted. Without needing too much elaboration we were left without any doubt that Sam went on to lead a very colourful and at times, wayward life. However, at the age of 51 something quite extraordinary happened to Sam. His heart began to beat in a way it had never done before and it longed to dance to the tune of his aboriginal roots. Once buried deep, these roots resurfaced strong once more and Sam couldn't ignore the call. Sam returned to his people and went through the Male Initiation that all Aboriginal boys go through. This is the passage from boyhood to manhood except Sam was 51 now and his contemporaries were wily, testosterone fuelled young men. What a thing to commit to! The men are forbidden to ever discuss what actually happens during the months that they are out living in the wild together but the intimation was that this was no tea party! Instead, you concluded that this was a punishing and gruelling test that pushed each man to the limits of his physical and mental endurance. Sam says he still bears the physical scars. From all of this however, something quite remarkable happened. Sam in a way was re-born and became reconnected to his Aboriginal soul, his life blood and his spirit and from absolutely nowhere, he began to paint. Without any formal training whatsoever, an incredible surge of creativity flowed from Sam, which could only have been borne from the imprint of thousands of years of his heritage. We were quite in awe of his story. He spoke eloquently and affectionately about all 6 exhibits but it was clear that Little Sandy Creek had a special place for him. However, through the process of it's creation I think he loved and utterly loathed it too at times! All aboriginal art tells a story, often they depict a landscape with a significant meaning that is not at all obvious by just looking at it. The accompanying story is as big a part of the picture as the actual painting itself. Its important to find out what that is. Little Sandy Creek is situated in the Red Centre of Australia, a very arid, unforgiving and harsh environment. It is a very valuable source of water to the people and it is highly revered. There are three main pools in the creek which Sam has depicted in the painting, what is remarkable about them is that they never appear to dry up completely and are a constant source of life giving water. I think the importance of this creek is also depicted in the scale and size of the painting. Sam also mentioned that the smaller less prominent circles are nods to his time of male initiation but given his vow of silence, we can only wonder what this might be. To be honest I think its quite enchanting that only Sam and his circle of brothers, his Bunji (means brother), will ever know. Who knows, maybe over time if we listen with our hearts, Little Sandy Creek will reveal more to us. So it was, we bought that painting but in reality it means so much more to us than just a painting. Little Sandy Creek has already taken its long trip over the ocean and now resides in safe keeping at the home of our dear friends back in the UK. Sam told us that he and his family, especially his children, were so excited that it would eventually adorn the wall of our home so far away from where it was conceived. We cant wait to send them that photo. It was such an honour to meet Sam and he will always be "Bunji" to us. Sometimes some of the best experiences in life are just never planned. Our Tassie trip drew to a close in the capital city of Hobart. We stayed at the Henry Jones Art Hotel, Australia’s first dedicated art hotel, and only one of a handful of such hotels in the world. It was perfectly located on Hobart’s waterfront and the building dates back to 1804 where it was known as H. Jones and Co. Pty. Ltd. IXL, a jam making factory and one of Australia's most successful businesses back then. The former jam factory has bee transformed into a sensitively restored and distinctive, five-star hotel, warm and welcoming but warehouse/industrial too, it was very cleverly done. We loved it, sometimes these places can be a bit "style over substance" but it wasn't, it all worked just as it should with out being pretentious. With only a few days in the city we did of course plump for the two main tourist attractions there. MONA is the largest privately owned art gallery in the world and anyone who has been there will understand when I say that it is just a bit, bonkers! It is the creation of David Walsh, an extremely successful profession gambler, who sank $75 million of his own money in creating his dream. What can I say? Its weird, wonderful and at times downright confronting. The whole place has been carved into the side of a cliff and it really does have a "James Bond film set" feel to it. We arrived at the the gallery on a camouflaged catamaran where we sat on purple, velvet thrones in an area called the "posh pit" whilst being served complementary canapes and wine by waiters in grey boiler suits! Do you see where we are coming from with this? Languishing in the "Posh Pit"
On entering the museum we took a glass lift down into the depths of the cliff. When we stepped out the first thing we came across was a very cool cocktail bar. The sandstone walls of the cliff were beautifully lit and of course a work of art in themselves. I said previously that some of the exhibits were confronting. Well there was one that had me somewhat agog. Please pardon my language but it was called "Cunts and Conversations". There on the wall at pretty much eye level, were 75 plaster cast molds of well, lady parts! One after the other all in a row, real life casts of lady parts, leaving nothing to the imagination. Underneath each one was "her name". I was astounded and dare I say it absolutely fascinated in a slightly uncomfortable way. I honestly never knew they came in so many shapes, sizes, configurations and proportions. I wasn't the only one, all the ladies there said exactly the same thing and yes it certainly did incite conversation. I refrained from taking any photos, that would've been too weird but feel free to google it if curiosity gets the better of you. As for the men they were not interested at all, nothing to see here, seen it all before or maybe it wasn't the done thing to show too much interest! Mind you I did think selling the "lady part soaps" in the gift shop was a bit much, I mean who would you ever give one of those to? No the boys were far more taken with the bubble shaped Porsche and the "Poo making machine"! Entering the room the stench hit you like a smack in the face. "What the hell is that?" "Its the poo making machine"said the guide, who clearly had become accustomed to the affront on his olfactory system. "Then 12 hours later it produces a poo, look over there, there's today's offering on the plate"
So it was too, perfectly formed poos on the plate preceded by all manner of fetid liquids bubbling and gurgling away in glass containers. The whole thing mechanically replicated the exact workings of the human digestive system. What kind of mind would invent this? You just couldn't help admire the ingenuity of it all. It was fascinating. Of course the boys loved it! So in essence, this was the way of MONA. Utterly bonkers but absolutely worth the experience. The lady parts still make me chuckle, one of those images that you just can't un-see! The Salamanca market is held every Saturday at Salamanca Place. The whole street is closed and comes alive with over 300 stalls selling fresh and gourmet produce, arts, crafts and produce from all over Tasmania. The weather was lovely and all the coffee shops and cafes were brimming with people sat outside enjoying breakfast and people watching. We really enjoyed pootling and mooching around all the stalls and soaking up the buzzy atmosphere. The craziest stall of all, nothing made sense! .......not failing to mention the wonderfully striking indigenous Warratahs which I have come to love. However, I wasn't too impressed with this stall and looking by the lack of customers I don't think I was the only one. Wallaby for breakfast? No thank you, in fact no to Wallaby full stop. Our time in Hobart was all too short. We really did love the feel of the place and everyone was so friendly and genuinely interested in who we were and what we thought of Tasmania. Well from North to South and everything in between we did have the most incredible time, so many diverse and wonderful experiences but before I close the chapter on our Tassie adventure there is just one more story to tell. I am excited to tell the story, so many of my blogs evoke fabulous memories and spell out unique times for us. Without exception this next one will be up there as a very special experience during our time here in Australia. 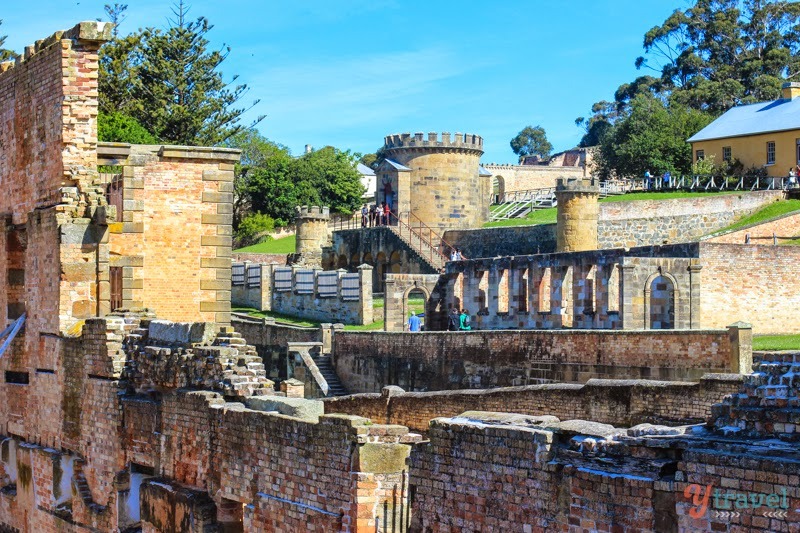 A few years back now, I sat on the sofa on a dark winter's night back home in the UK, the wood burner was roaring and I was all snug and cosy, I watched Tony Robinson in a TV documentary all about Port Arthur in Tasmania and the penal colony that was established there. Tasmania? It seemed like another world, so, so far away. I was totally transfixed and somewhat morbidly fascinated. It was en route to Hobart, well just an hours diversion off, and I just had to see it or rather more appropriately "feel" it for myself. Hubster was equally as interested. 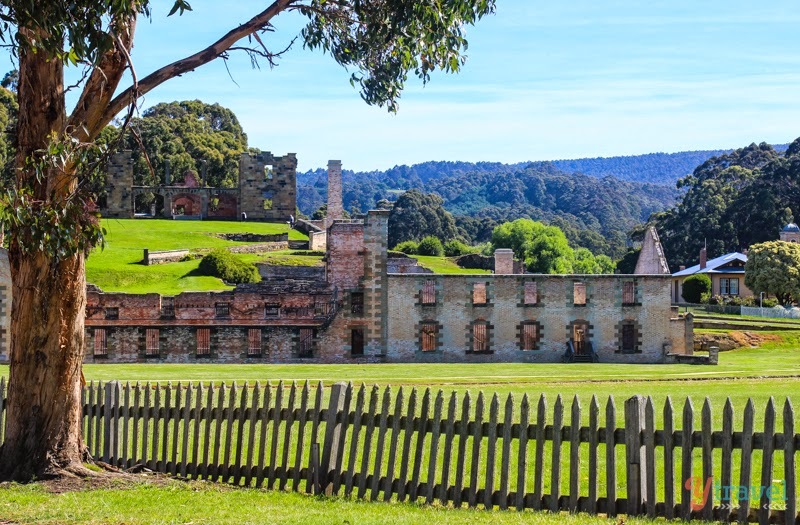 Today it is now one of Australia's most significant heritage areas and an open air museum. ............ but check this out. Most of these convicts were transported by ship in appalling conditions from the UK all the way to Tasmania, across some of the most treacherous waters in the world. How evil these men must have been? Well this is the thing, many of these men were not dangerous and hardened criminals at all (some were of course), but many were banished from their home country and all they knew for such petty crimes as stealing umbrellas and note aged just 13! The most heartbreaking story for me was the transportation of a 9 year old boy whose only crime was stealing a box of toys. Show me a child that hasn't stolen another child's toy or would've if they could've! Port Arthur has a violent and troubled history as a penal colony, yet it’s pastoral beauty brings this contrasting sense of peace and happiness too, I cant explain that, its something you have to feel by being there. It was bizarre that such evident cruelty, punishment and incarceration was also the place for such incredible innovation and creativity. Here an extensive library of some 13,000 books was housed, a highly efficient working farm was run, Here, beautiful landscaped gardens and allotments were kept and the most advanced ship building yard of its time along with 30 buildings with impressive examples of masonry and architectural design were built. All of this work was carried out by the same convicts who had to endure sleeping on freezing, wet stone floors, in sodden clothes, in cells with iron bars, all open to the perishing elements. It can be bloody freezing in Tassie. The very same convicts were also regularly punished with the cat o nine tails or worse and many more suffered greatly with persistent respiratory illness and thousands succumbed to that. Convicts maybe but these chaps were pretty handy too so to speak. What struck me also was just how small in stature these men were and yet so incredibly strong and resilient. I cant help think or rather hope that in some small way their captors had some admiration for them because I certainly did. However there was another prison in Port Arthur, set aside from the main building, up on the hill, positioned as such for a reason. This separate prison was the eeriest place of all and one that made me realise just how cruel humans can be to one another. I felt the anguish and the desperation seeping from the walls from all who once slumped in those cells, shut off 24/7 from the sensory world. This form of punishment broke more men than the cat o nine tails ever could and their diaries reflected that. No-one likes the silent treatment do they? separate cubicles, each man was strictly isolated from his fellows. number of cases of ‘madness’ among the prisoners. These rates were many times higher than those found at traditionally run prisons . Men who offended while in the Separate Prison could be sent to‘the dumb cell’ or punishment cell. This cell lay behind four thick doors and was completely light and sound proof. Here men might languish for up to 30 days. Going back to that documentary with Tony Robinson, he endured the "dumb cell" for 25 minutes and emerged a quivering wreck and in tears. I endured it for no more than 20 seconds, it was pure hell. and incited panic immediately. The regime was designed to achieve the most intense social isolation and control. A warder sat at a desk in the central hall, keeping an eye on all the cell doors and the corridors. Warders patrolled the corridors in felt slippers, using sign language to ensure that the prisoner heard no sound. Each man wore a mask when outside his cell to prevent communication. At first he was only allowed to read the Bible but later other ‘improving’ books were allowed. He took exercise alone in a small yard and was fed through a hatch in his cell door. Dozens of rules and rigid daily routines reinforced the inmate’s sense of powerlessness. Rather than promoting rehabilitation, this awfully cruel regime certainly ensured the progressive insanity of its inmates. When you are there, you feel as much as you see and those feelings will live with me always. That said its important to understand what they went through. Very important indeed.